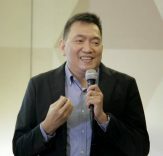 I can understand the frustration of “Edgar” for this particular foreclosed property he bought from a bidding for Pag-IBIG foreclosed properties. This is very similar to the horror stories we’ve heard about buyers of occupied properties. They parted with their hard-earned money, but after several years, they still have no possession of the property. This is why we don’t recommend buying occupied properties, even with the cheap price that usually come with properties like them. As investors, we learned our lesson early from other investors, and we never purchased any that were occupied. As a real estate broker (back when I was still active), I remember awkward moments with prospective buyers because they were surprised when I would recommend against buying a property that was occupied. This is just one of the reasons why I’m glad we have stopped brokering foreclosed properties. So far, I’ve seen some banks who prefer not to sell properties that have problems like illegal occupants (they only sell a property if they have possession). Most will just indicate in their listings that a property is occupied (among a number of possible problems) and that these are for sale on an “As-is, where-is” basis. I’ll try to answer these next. Last June 2017, I noticed that majority of the foreclosed properties inside listings released at that time were occupied/had illegal occupants. Because of this, I sent an email reminder to all subscribers. Since foreclosed properties are for sale on an ‘as-is, where-is’ basis, you will have to be the one to eject the occupant(s) if you decide to buy an occupied property. It can be very costly in terms of time (it usually takes years to have a successful ejection), effort, and money, not to mention the many sleepless nights. It’s actually very dangerous if the occupants are hostile. The quick answer is – because some still do get sold. Some people actually buy these properties and they know how to handle them. 1. Those who are very experienced and know how to deal with illegal occupants, and come up with a ‘win-win’ agreement so the occupants will leave voluntarily and peacefully. 2. Those who have the means and connections that can help with the ejectment. But here’s my advice: Just walk away! I also know people who have bought occupied properties and they just ended up wasting their money, which is why I advice against it. If you were to ask me, I prefer to just walk away and move on to the next property. So that you can avoid these properties, this is the first thing you need to check as part of due diligence, which I’ll explain next. Actually, this should come as no surprise if you’ll refer to my property due diligence checklist. You can find this on page 2 of my Property Due Diligence Checklist. 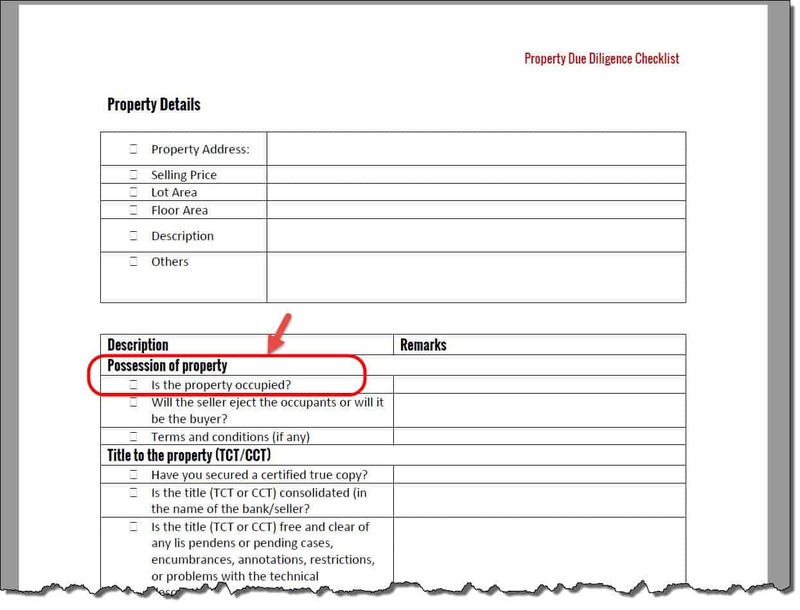 I put it on top of the checklist so that if you find out that a property is illegally occupied, then you don’t have to waste your time, just move on to another property. This will save you from a lot of headaches and regret down the road. Please take note, even if a listing indicates that a property is unoccupied, always take that with a grain of salt. The only way to be sure is by personally inspecting a property. By the way, please be very careful when inspecting a property, most especially if the bank/lending institution does not have any caretakers on the property you are interested in. I remember one time when we visited a property based on info from the bank that it was not occupied (this particular bank usually assigns a caretaker for each property), we were shocked when we realized we were not talking to the bank’s caretakers (turns out we were talking to the former owner’s relatives), so we immediately left and informed the bank. Again, if you do find a listing with a lot of foreclosed properties that are illegally occupied, even if it is so cheap, please remember my advice above. You should think long and hard before considering to buy an occupied foreclosed property. You can’t say I didn’t warn you! Next PostGoodbye OMI, Hello Conveyance!